According to the Census Family After-tax Low-Income Measure (CFLIM-AT), 19.6% of children lived in low income in 2016, down from 20.9% in 2015. The concept underlying the CFLIM-AT is that all persons in a census family are in low income if their family after-tax income is below half of the median after-tax income, adjusting for family size. For example, in 2016, a three-person family would have been in low income if its after-tax income was below $35,375. The decline in low income represents continuation from 2014, when the rate was 21.8%. From 2010 to 2013, the low-income rate for children was steady between 22.2% and 22.4%. The declines in the low-income rate for children are associated with increased government spending on child benefits in 2015 and 2016. In 2014, the median federal child benefit received by couple families with children was $2,620. This rose to $3,350 in 2015 and to $3,860 in 2016. For a lone-parent family, the median federal benefits rose from $3,760 in 2014 to $4,490 in 2015 and then to $5,060 in 2016. All provinces and territories marked a decline in child low income from 2015 to 2016. Child low income also declined for children in couple families and children in lone-parent families in most provinces and territories. Among provinces, the child low-income rate was lowest in Quebec (16.3%) and Alberta (18.1%), while it was highest in Manitoba (29.0%) and Saskatchewan (26.7%). Yukon (14.5%) had the lowest child low-income rate among the territories, while Nunavut (34.8%) had the highest rate. The rate of children living in low income fell from 2015 to 2016 in all provinces and territories. The largest declines were in Prince Edward Island, New Brunswick, Quebec, Ontario, British Columbia, Yukon and Nunavut, where the rates fell by at least 1.5 percentage points. Declines in the child low-income rates were relatively small in Saskatchewan (down 0.4 percentage points) and Alberta (down 0.1 percentage points), where the effects of the slowdown in the resources sector continued to be felt in 2016. In 2016, 47.4% of children in lone-parent families and 11.7% of children in couple families were in low income. For children in lone-parent families, this rate was down 2.6 percentage points from 2015, while for children in couple families it was down 0.8 percentage points from 2015. Lone-parent families tend to have lower family income than couples, which may make them eligible for larger child benefits. The incidence of low income for children in lone-parent families varies among provinces and territories. Over 60% of children in lone-parent families were in low income in Manitoba, Saskatchewan and Nunavut. The lowest provincial and territorial rates of low income among children in lone-parent families were in Yukon (34.8%) and Quebec (39.9%). The low-income rate among children in lone-parent families fell the most in the Atlantic provinces of Newfoundland and Labrador (-4.6 percentage points), Prince Edward Island (-4.7 percentage points) and New Brunswick (-4.8 percentage points). Child low income fell in every census metropolitan area (CMA) from 2015 to 2016, excluding Saskatoon, Calgary and Edmonton. In Atlantic Canada, the decline was largest in Saint John, New Brunswick, where the child low-income rate fell from 24.9% in 2015 to 23.5% in 2016. 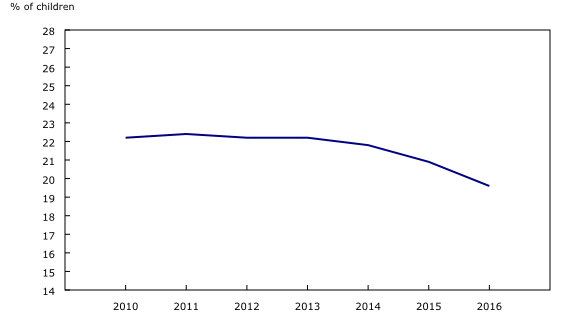 In Quebec, the decline was largest in Sherbrooke (from 17.4% to 15.8%), and Montréal (from 19.7% to 18.1%). In Ontario, the decline in child low income was largest in Belleville (from 21.3% to 18.9%), closely followed by Windsor (from 25.7% to 23.6%). The child low-income rate also fell in Toronto, Ontario's largest CMA (from 22.8% to 21.0%). In the Prairie provinces, the largest decline in the child low-income rate was in Lethbridge, where low income fell from 18.9% to 17.0%, followed by Winnipeg (from 24.3% to 23.1%). The child low-income rate was stable or rose slightly in Saskatoon (+0.2 percentage points), Calgary (+0.1 percentage points) and Edmonton (no change), associated with slowdowns in the resource economy in those areas. Vancouver, where the child low-income rate fell from 21.5% to 19.6%, marked the largest drop in child low income among CMAs in British Columbia. At the national level, the median after-tax income of families and persons not in families, remained virtually unchanged from 2015 ($50,550) to 2016 ($50,620). However, median incomes fell in CMAs such as Calgary, Edmonton, St. John's, Saskatoon and Regina, where resource sector industries comprised a larger portion of the local economy. Calgary and Edmonton were the top two median after-tax income earning CMAs, but these CMAs saw the largest decreases in median after-tax income from 2015 to 2016. Calgary ($63,540) saw a drop of 4.0%, while Edmonton ($61,330) had a decline of 2.9%. Decreases in after-tax income were also seen in Regina (-1.3% to $58,700), Saskatoon (-1.8% to $57,750) and St. John's (-1.9% to $55,490). Other large CMAs maintained a steady after-tax income growth, continuing trends which have now lasted for several years. Montréal ($45,210) had the largest growth from 2015 to 2016 among all CMAs, at 1.3%. Vancouver ($50,310) grew 1.2%, while Toronto ($50,620), along with Windsor ($50,510) and Brantford ($50,020), grew 0.9%. Data for 2016 family and individual income from the T1 Family File (T1FF) are now available. Data are derived from personal income tax returns filed in spring 2017, and are available for Canada, the provinces and territories, as well as various sub-provincial/territorial geographic areas. Data are not adjusted on the basis of Statistics Canada's population estimates. This release uses the census family concept. A census family refers to a married or a common-law couple, with or without children at home, or a lone-parent family. Results also include persons not in a census family. This release reports on low-income statistics using the Census Family After-tax Low-Income Measure (CFLIM-AT) methodology. Individuals are defined as being in low income if their adjusted after-tax income falls below 50% of the median adjusted after-tax income. Adjusted after-tax income is derived by dividing census family income by the square root of census family size and assigning this to all members of the census family. Persons not in census families are treated as census families of size 1. Beginning in 2018, Statistics Canada has revised the methodology used to calculate the CFLIM. Readers interested in more information should refer to the paper Methodology Changes: Census Family Low Income Measure Based on the T1 Family File. Data based on the updated CFLIM-AT methodology can be found in tables 11-10-0018-01 and 11-10-0020-01. Data based on the former CFLIM methodology are available in table 11-10-0015-01. Low-income estimates reported in this release differ from those reported in other sources, such as the 2016 Census or the Canadian Income Survey (CIS). Reasons for this include differences in the unit of analysis and the data coverage. The census and CIS report on low income using the household unit of analysis (instead of census family), and exclude the territories, collective dwellings and Indian reserves. Users interested in more details should refer to the paper Low Income Measure: Comparison of Two Data Sources, T1 Family File and 2016 Census of Population. After-tax income refers to total income less income taxes. Income taxes refers to the sum of federal income taxes, provincial and territorial income taxes, less abatement where applicable. Total income includes employment income, investment income, government transfers, pension income and other income. In accordance with international standards, capital gains are excluded from total income. The median is the point at which half of the families' after-tax incomes are higher and half are lower. Estimates of federal child benefits reported in this release include the Canada Child Tax Benefit, the National Child Benefit Supplement and the Universal Child Care Benefit from 2014 to 2016, and the Canada Child Benefit for 2016. Provincial child benefits are also included in after-tax income, but are not reported separately. All figures for previous years have been adjusted for inflation as measured by the Consumer Price Index. All data in this release have been tabulated according to the 2016 Standard Geographical Classification used for the 2016 Census. A census metropolitan area (CMA) is formed by one or more adjacent municipalities centred on a population centre (also known as the core). A CMA must have a total population of at least 100,000, of which 50,000 or more must live in the core. The technical reference guide Annual Income Estimates for Census Families, Individuals and Seniors, T1 Family File, Final Estimates (Catalogue number72-212-X), presents information about the methodology, concepts and data quality for the data available in this release. Data for Income of Families (Catalogue number13C0016, various prices), Income of Individuals (Catalogue number13C0015, various prices), and Income of Seniors (Catalogue number89C0022, various prices) are available for Canada, the provinces and territories, federal electoral districts, economic regions, census divisions, census metropolitan areas, census agglomerations, census tracts, and postal-based geographies. These custom services are available upon request.